Professional font editor. Version 5.0.4 for Mac and Windows. TypeTool 3 released in March 2007 includes support for OpenType fonts with up to 65,000 glyphs, Unicode 5.0 support, new bitmap Background and outline Mask layers, improved Bézier drawing with open contours and tangent points, multi-line metrics and kerning editing, superb screen quality autohinting, better printouts, and much more. You can create new fonts, automatically or manually hint and kern your fonts, add ligatures, old style figures, fractions, currency symbols, correct em dashes, apostrophes, quotation marks and foreign characters to your fonts. Make your own dingbat or clipart fonts, Make font variations with the new transformation tools, Print font reference tables, Rearrange and rename your font's characters. Make custom end-of-story markers for your newsletter, convert fonts between Adobe Type 1 and TrueType formats. Edit fonts with up to 65,000 glyphs with support for 2-byte encodings. Bitmap font conversion - convert from any supported format to any other. Support for bitmap TrueType fonts - with full Unicode and optional grayscale support. For Mac and Windows. Professional image editing tools, transformations and filters - from Pencil to Gaussian blur. Rasterization of outline fonts to bitmaps - create sample versions of your TrueType or Type 1 fonts and distribute them without risk over the Net. Convert bitmap to outline fonts - convert scanned images or digital photographs into outline fonts in minutes (requires FontLab or TypeTool installed on the same computer). Unicode support - multiple codepages and encodings, support for very big fonts. 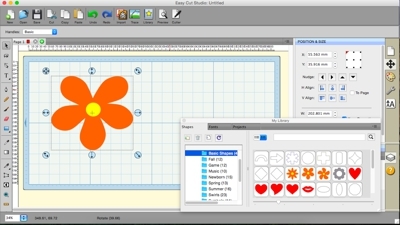 Easy Cut Studio is an extremely user-friendly program that allows you to cut TrueType fonts, OpenType fonts and various shapes, as well as SVG, PDF with your electronic cutting machines. The advanced design and layout tools will make your work easier and faster. Available for Windows and Mac OS X.